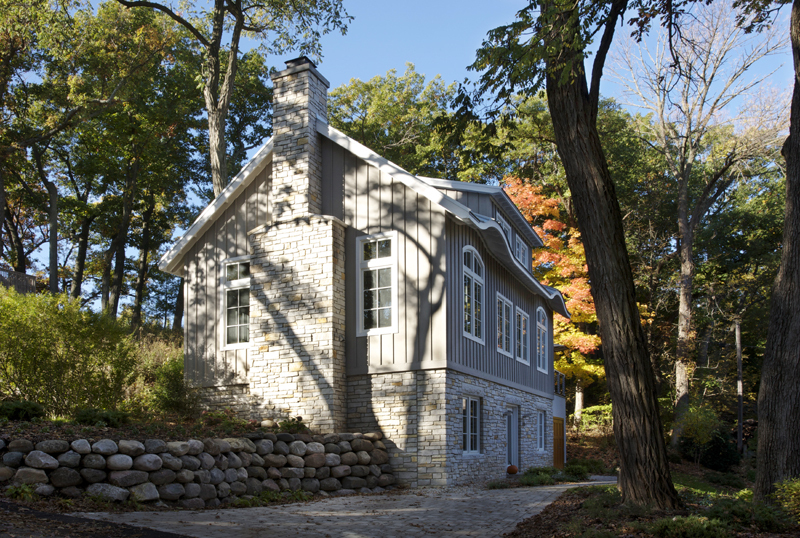 Perched on a steep slope above Lake Geneva, in the Town of Linn, Wisconsin, this new weekend home strikes a comfortable balance between the vernacular charm of its neighbors and the contemporary lifestyle of its owners. The steep hillside, with slopes exceeding 40%, provided the opportunity to create an additional level of living space concealed from view on all but the lake-facing side. When approached from above, the home appears to be a 1-1/2 story cottage, similar in scale to its older neighbors. Protected from the elements on three sides, the home is entered from the lower level by way of a grass terrace. 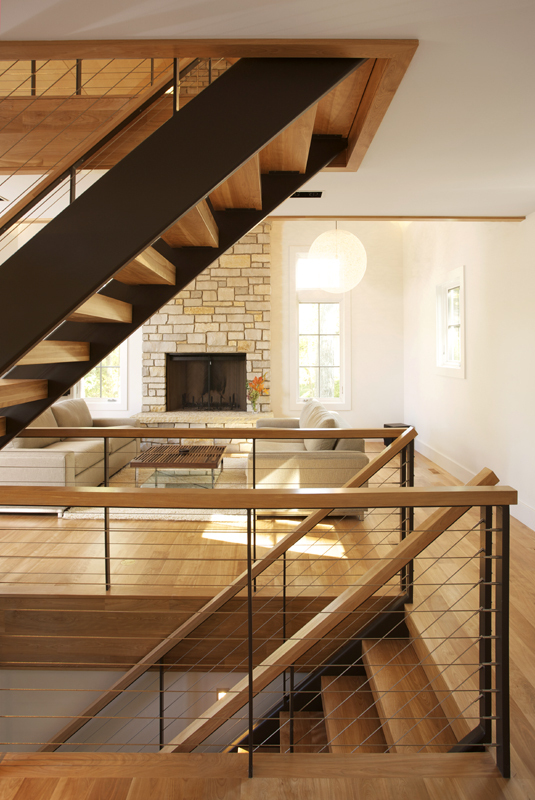 A centrally positioned stair rises from the lower level entry to a loft, providing a screen between the living and dining spaces on the main level. The loft, open at both ends, overlooks the kitchen and living room and provides a retreat with views of the lake. 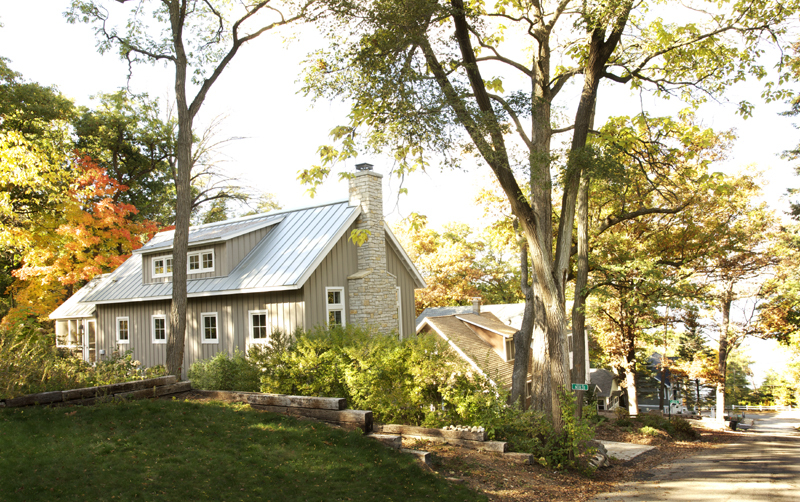 The exterior is finished in standing-seam roofing, board-and-batten siding and local stone. Birch was used throughout the interior, including ceiling panels which conceal cove lighting. The house combines these common vernacular materials in a simple geometrical composition that appeals to both traditional and contemporary sensibilities.